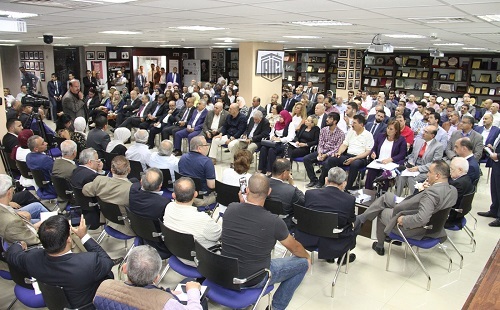 AMMAN - Talal Abu-Ghazaleh Knowledge Forum (TAG-KF) held an open discussion session, chaired by HE Dr. Talal Abu-Ghazaleh, to discuss the proposed new income tax draft law for 2018 and attended by more than 300 Jordanians from all walks of life in their individual capacity. In his remarks at the beginning of the session, Dr. Abu-Ghazaleh welcomed the attendees from various economic, social, academic and youth sectors as well as political parties coming from all Jordanian governorates, cities and camps. Dr. Abu-Ghazaleh expressed his pleasure to host all Jordanians at TAG-KF which was established to become a platform to express, share and exchange opinions and points of view regarding various national issues related to the country and citizens. 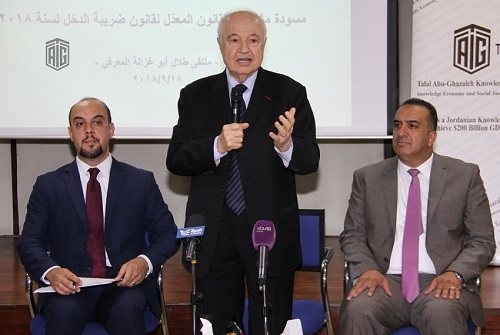 During the session, Dr. Abu-Ghazaleh affirmed that the objective of the gathering was to submit recommendations and suggestions by the attendees regarding the draft of the new Tax Law to Jordan’s government and Parliament while, at the same time, highlighting the keenness of participants to respect each other’s perspectives as well as to respect government officials and institutions, saying that positive communication between the citizen and decision maker is the path for any reform. Participants unanimously agreed, during the national, objective and civilized gathering, to make a request to the government to postpone the submission of the new draft tax law and revise the tax system as a whole in view of the economic and social conditions that Jordan endures. Additionally, they urged the government to scientifically, professionally and technically look into the tax burdens, to be precise, sales taxes, income tax and fees among others, after consulting with experts and specialists from all sectors and institutions during a roundtable discussion that gathered all stakeholders to achieve the aspired goal of the law. They also underlined the significance of a comprehensive economic reform and stimulating the economy as a means for more productivity and a larger tax base that would consequently generate more tax revenues. The participants also agreed on other significant points: maintaining personal and family exemption as stipulated in the existing law, maintaining tax imposed on the industrial sector as stipulated in the existing law, raising tax imposed on the banking sector to 37% instead of 35% as stipulated in the existing law, the abolishment of the 1% social solidarity tax imposed on the income of individuals that is subject to income tax and keeping the same percentage on the net profits of companies provided that purposes of its disbursement be indicated. Meanwhile, a committee from the participants was formed to draft recommendations and suggestions to be submitted by the TAG-KF Chairmanship to the Government and Parliament.